SAINT AUGUSTINE – The Feb. 8 meeting of The Textile Arts Guild of St. Augustine will feature Michelle Belson who has been weaving and talking about Color Gamps since 1990. Belson, co-owner and founder of Lunatic Fringe Yarns in Tallahassee, will discuss this weaving process following the Guild’s 10 a.m. business meeting. There will also be a touchable display of various yarns used in Color Gamp weaving. The Guild meets in the City Hall/Lightner Museum Building, Suite 143, 75 King St., at the southwest end of the Lightner courtyard. Guild members also will participate in two events this month, according to Ruth Kurlandsky, president. Feb. 10, 10 a.m. – 3 p.m., a Spin-In at the Visitor Information Center, 10 Castillo Drive. 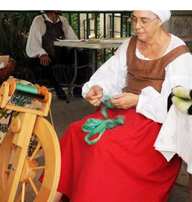 Feb. 11, 11 a.m. – 6 p.m., Made in St. Augustine Festival at Francis Field, across from the city’s parking garage. For more information, please contact the Guild at TextileArtsGuild@gmail.com, or through its Facebook page, St. Augustine Textile Arts Guild.